The Native Americans have a very rich and cultural history and they are known for many things throughout the history of what is now North America. One of the many things the Native Americans are known for is their crafts, and one of the most popular crafts of these people was their Native American pottery. A couple thousand years ago when agriculture was discovered this made the nomadic Native Americans settle down. Out of the need to have the means to more easily transport water and cook the art of Native American pottery was born. As the art of making pottery flourished many different shapes and designs were thought of and this helped to suit the various needs. Soon Native American tribes all over the United States started becoming known for their different shapes and styles of Native American pottery. Many historians and archeologists believe that pottery was discovered because ancient people used to line their hand woven baskets with mud-clay. When the baskets were burned so that corn and other food could be dried, the basket would be consumed but the hard clay would still be intact. At first the Native American pottery was made mainly for practical purposes, such as storage, cooking and transport of water, with little thought going into the artistry. The majority of early pottery in Native American culture was not adorned with any decorations and they were not symmetrical. 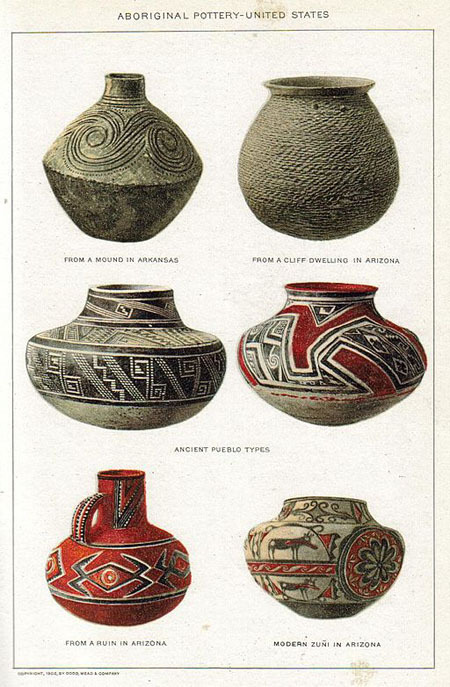 A little later in native history decorative designs began to appear on Native American pottery. Many scholars have tried to find meaning in the artwork but most Native Americans are reluctant to explain their meanings to people outside of their tribesmen. Even if there are any spiritual or traditional meanings to these designs, most people outside of the tribe will probably never know the potter's true intent. Native Americans do not discuss their sacred traditions, or any of there ceremonial rituals and symbols with outsiders. Many of the symbols on Native American artwork come from their environment and things such as nature, animals, humans, and their many gods. This pottery was also used in many different spiritual rituals, which is probably why some of the pieces were decorated with gods and animals they thought to be sacred.